This is one I was sure I had seen back in the day. In fact, there is a lot I do remember about it. But it wasn't until it wasn't recently covered by House of Self-Indulgence that I remembered it. Or. More to the point I remembered I hadn't seen it. There are bits I do remember. I think it is due to seeing it on Showtime or Cinemax late at night. Leah, the witch from the woods, certainly is a character I would have remembered. In fact I think I do. For my 3rd edition game I had a cleric character fall in love with a witch. Granted this is not something strange for me, but there are a of lot similarities. I love the idea of the devil-haunted woods/valley. Keep an eye out for all the faces. Expert tip: if the local Shawnee tribe is too afraid to go into a place...maybe don't go into that place. Just saying. What I like about this film is it mixes bits of witchcraft lore with Irish myths and local Indian legends. A heady brew for someone that grew up in the mid-west not far from some of the most famous burial mounds in the country. The final battle was cool, but really dark. Dark as in a lack of light to see what was going on really. Naturally, I am going to compare this to The Witch. This covers the same time period (roughly) and the same area of the country (close enough). Where the Witch is visually stunning and relies on mood and atmosphere. 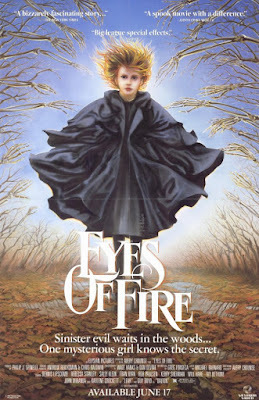 Eyes of Fire is more dream-like and tests what we consider reality (in the film). Comparing them on a visual level though is not fair. The Witch was filmed in HD and I watched it on a Blu-ray. Eyes of Fire wasn't and the copy I watched was a poor VHS to DVD transfer. Both were, and are, stunning for their times. I fear that Leah and Thomasin would not get along. Thank you! i was trying to remember the title of this a few weeks ago. I remember bits of it and was thinking about it as I was writing some notes for my Colonial OSR game. I need to check this out, having also grown up in the Midwest near famous Native American mounds (Great Serpent Mounds for me). This an old favorite of mine, and despite having only seen it once long ago it still has a lasting presence whenever I'm planning out a game featuring dark foresty places and the spirits that live there. I remember it really standing out in contrast to all the film-by-numbers slasher crap we were watching back then.